This type of testing can help take out the “what if” questions. Rather than guessing which formatting and design features will be most effective, A/B testing will help enable better, data-informed decisions. In order to conduct A/B testing, your first step is to make slight modifications to a webpage. Your choice of what to redesign or restructure will depend on your goals, or what you want to achieve. Are you looking to get more subscribers? Convert more website visitors into potential leads? Lower your bounce rate? These are all things to consider when setting your pages up for testing. When it comes to modifying your webpages, you may consider doing a complete redesign, or something as simple as changing a call to action, image, headline, or copy. Half of your users will be shown the original version (the control group) and the other half will be shown the modified version (the variation group). As these visitors interact with your webpage, analytics will determine their engagement level. Ultimately, the analytics will determine three whether or not changing the webpage had a positive, negative or no effect on the user. You can set up A/B testing one of two ways. One option is to replace the element you want to test before the webpage loads. The other option would be to redirect to a different page. The first option is great when you’re changing a single element on your site, and the second works better with a complete page redesign. Again, this will all depend on your company’s overall objectives. Prior to any testing, your company will want to look at the analytics you already have. From your analytics, you should be able to identify pages that have low conversion rates or high drop-off rates that can be revamped. From there, you can determine what needs to be modified for A/B testing. You need to find a way to know if the modified version is more successful than the original. Conversion goals can be anything from an increase in click through rates, click to product purchases or e-mail sign ups, to name a few. Within the company, you should figure out why you think the modified version will work better than the original. Why launch this particular A/B test? Focus on what your hypothesis will improve by making these changes. We recommend making a list of the benefits a modified version of a webpage may potentially have over the original. From here, you can use A/B testing software to make your job a little easier. Most A/B testing tools have a visual editing option that will make the modifications easier for you. We recommend using Google Optimize, Optimizely or Visual Website Optimizer. Now the hard part, you have to sit back and wait for your users to participate! The interactions will be recorded and the data will be measured and compared to see how each page preforms. Lastly, your A/B testing software will present the data and show your company how each page preformed. You will then be able to see if the modifications you made had the effect you hypothesized. If it didn’t, it’s back to square one! You can continue this process as many times as you need to in order to get the desired results. If you are doing a website redesign, consider using A/B testing to figure out what modifications will work best for your users. Likely, the goal of your company is to increase traffic on the website and, in turn, convert the user. Depending on your area of business, that conversion could look like purchasing a product or signing up for your email list. Regardless, A/B testing will provide you with the data you need to optimize your user experience and increase the chances of a conversion. 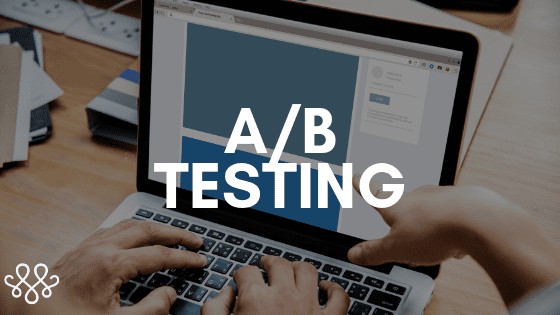 Quick tip: A/B testing can be used for more than just webpages. Email marketing tools, like MailChimp, offer options for A/B split testing when running campaigns. You can send email variations to certain audiences and test things like subject lines, CTAs, or even the time you send it and see what your users prefer. As you gather more data, you can then make adjustments as you see fit. A/B testing for campaigns can take your digital marketing efforts to the next level, and help you reach your goals faster. Not to mention, you’ll practically become an expert in email marketing. – Know how long you want to run your test, and don’t give up too early. Stopping the test early could cost you very important information and data. However, it’s also not wise to end your A/B testing too late. Use a calculator to determine how long your test should run for in order to be successful for your company. – Make your A/B test consistent. Consistency is key in these types of test. For example, if you are making a change to a button on your homepage, this button should be seen on the rest of your pages for your site. – Run multiple A/B tests! If you aren’t getting the results you want, don’t give up. It’s completely normal to redo tests and it’s really a matter of trial and error. Use your data to figure out what works for your users and what doesn’t. – Never wait to test the variation until after you’ve tested the control. Your tests should take place simultaneously, always. – Don’t only focus on big changes, small changes can be just as effective for your users. Sometimes, the little details are really the ones that matter most. – Don’t run multiple tests at the same time. As you can imagine, this can confuse your user and the results on your end can get confusing, too. Instead, stick to one hypothesis, run that test, and then analyze and start over. Here at MAKE, we would love to help you redesign your website and work out a template to help your business effectively utilize A/B testing in your website, or emails. Set up a free website audit with us today! We would love to chat and help you take your business where you want it to go.